The evidentiary weight of North Korean defectors’ testimony depicting crimes against humanity has drawn considerable attention from the international community in recent years. Despite the ramped up attention to North Korean human rights, what remains unexamined is the rise of the transnational advocacy network which drew attention to the issue in the first place. 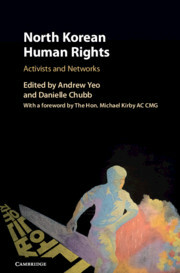 In a recent book edited by Andrew Yeo and Danielle Chubb, North Korean Human Rights: Activists and Networks (Cambridge University Press 2018), a team of scholars trace the emergence and evolution of North Korean human rights activism and challenge existing conceptions of transnational advocacy, how they operate, and why they provoke a response from even the most recalcitrant regimes. In this event, two contributors to the book and a leading figure in the North Korean human rights campaign share insights into the politics, strategy, and policy objectives of North Korean human rights activism in both domestic and transnational contexts. Andrew Yeo is Associate Professor of Politics and Director of Asian Studies at The Catholic University of America in Washington DC. He is the co-editor (with Danielle Chubb) of the newly published North Korean Human Rights: Activists and Networks (Cambridge University Press 2018). He is also the author or editor of Asia’s Regional Architecture: Alliances and Institutions in the Pacific Century (Stanford University Press, forthcoming 2019); Activists, Alliances, and Anti-U.S. Base Protests (Cambridge University Press 2011); and Living in an Age of Mistrust (Routledge Press 2017). His research and teaching interests include international relations theory, East Asian regionalism, social and transnational movements, overseas basing strategy and U.S. force posture, Korean politics, and North Korea. His scholarly publications have appeared in International Studies Quarterly, European Journal of International Relations, Perspectives on Politics, Comparative Politics, Journal of East Asian Studies, and International Relations of the Asia-Pacific among others. He has also contributed pieces or provided commentary for MSNBC, Channel News Asia, CBS Radio, Voice of America, the Wall Street Journal, the Washington Post, New York Times Magazine, Al Jazeera, and the Korea Times. He is on the advisory boards of the U.S.-Korea NextGen Scholars Program and the Korea-America Student Conference (KASC). He received his Ph.D. in Government from Cornell University, and B.A. in Psychology and International Studies from Northwestern University. Celeste L. Arrington is Korea Foundation Assistant Professor of Political Science and International Affairs at the George Washington University. She specializes in comparative politics, with a regional focus on the Koreas and Japan. Her research and teaching focus on law and social movements, the politics of redress, the media, litigation, lawyers, policy-making processes, historical justice, North Korean human rights, and qualitative methods. She is also interested in the international relations and security of Northeast Asia and transnational activism. She is the author of Accidental Activists: Victims and Government Accountability in South Korea and Japan (2016) and has published in the Comparative Political Studies, Law & Society Review, Journal of East Asian Studies, Pacific Affairs, Asian Survey, and the Washington Post, among others. She received a Ph.D. from the University of California, Berkeley, an MPhil from the University of Cambridge, and an A.B. from Princeton University. She is currently writing a book that analyzes the role of lawyers and legal activism in Japanese and Korean policies related to persons with disabilities and tobacco control. Greg Scarlatoiu is the Executive Director of the Committee for Human Rights in North Korea (HRNK). He is a visiting professor at Hankuk University of Foreign Studies and instructor and coordinator of the Korean Peninsula and Japan class at the U.S. State Department’s Foreign Service Institute (FSI). Scarlatoiu is vice president of the International Council on Korean Studies (ICKS). Scarlatoiu holds a Master of Arts in Law and Diplomacy from the Fletcher School, Tufts University, and a Master of Arts and Bachelor of Arts from Seoul National University’s Department of International Relations. He completed the MIT XXI Seminar for U.S. national security leaders in 2016-2017. Scarlatoiu was awarded the title ‘Citizen of Honor, City of Seoul,’ in January 1999.